Well folks it looks like another month has come and gone. Where does the time go? This month we found out how to keep cool in summer, were treated to a custom kawaii car, found out how to live life as a punk, and learned all about big eyed art. Oh yeah… and Mishief made me look like a complete fool - twice! Thankfully, as ever, we got to meet some great kawaii designers and crafters along the way. The Fancys, Vincent Low, Fashion Candy, and Toxiferous, to name a few! What a month! See you all again soon for more kawaii capers. OK readers, get ready for some kawaii art. What? We can’t have some culture here at KawaiiPunk? Today I’m going to tell you about the cutest of all the artistic movements, the “big eyed kids, animals, and stuff” movement. 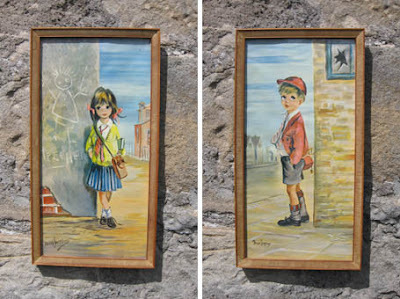 Popularised throughout the 1950s and 60s the “big eyed” (sometimes referred to as “sad eyes” or “waif”) style of painting could be found above the mantelpiece of many a discerning art lovers’ home. 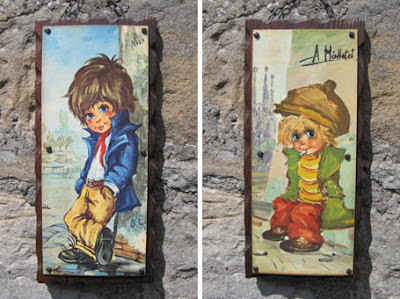 As the 1960s came to an end the popularity of big eyed paintings started to wane, although their influence could still be seen in the popular crazes of string art and macramé that came to define the décor of many a seventies living room - but that’s another story! If you’d like to get your hands on some big eyed art, then I suggest a visit to Etsy’s vintage section… ah Etsy, is there anything you can’t do? That’s right folks, for one week only you can save 15% on all KawaiiPunk tees at our super cool RedBubble store. And… if you go kawaii crazy and buy five or more t-shirts, you can get free shipping as well! How cool is that? 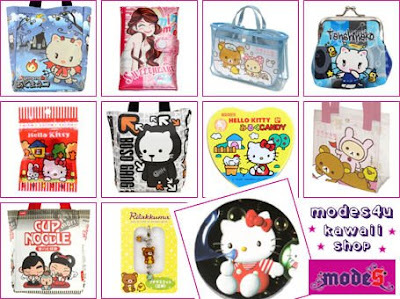 Modes4U is a kawaii shop that has a truly fantastic range of products and brands, all just waiting for you to come along and snap them up! Akuma Neko, Boso Gang, Hello Kitty, Mimori, Minmie, Monster Dolls, Q-Lia, San-X Mamegoma, San-X Rilakkuma, Tenshi Neko, they’re all right there! It’s got clothes, accessories, bags, stationery, stickers, dolls, hobby and crafting supplies, it’s even got cute candy and snacks! It really is the perfect place to relax and spend some quality shopping time. In fact, I’m heading over there right now. Feel free to join me! I’ve never been one to keep up with the latest trends and fashions. I don’t watch TV, haven’t got a radio, have never read a newspaper, and have no idea what Lady Gaga is. In fact, I’ll freely admit that I don’t have a clue about anything! I used to work as a High Court judge, if you’re wondering! 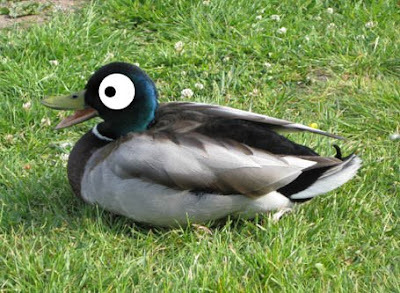 As you can see I have kawaiified a duck by drawing a big eye on it. I’m looking to expand beyond ducks for future kawaiifying projects, but thought you might like to see the results of my initial tentative steps into this new and exciting pastime. I reckon it could really take off - like the hula hoop or something! Wow! Thanks your honour! It’s great to hear from such a well respected figure in society, and what a great idea too! I think your process of kawaiification could be the next big thing! P.S. I’m reliably informed by the Mischief Mascot that Lady Gaga is a children’s entertainer who sings - kind of like a rambunctious clown! 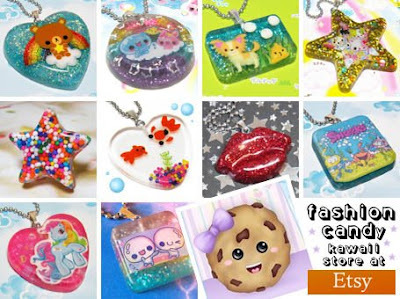 Fashion Candy is an amazingly cute and crafty shop at Etsy that is just packed with all things sparkling and shiny. From pendants and bracelets to rings and earrings, if it’s shimmering sweetness you’re after then this is the shop for you. And it’s not just jewellery either! 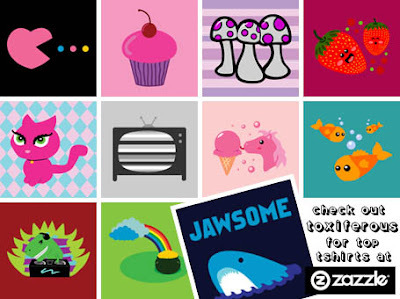 The Fashion Candy shop also sells prints featuring an awesome array of cute and colourful characters. Believe me, this shop is definitely worth a look! As an incredibly hip, trendy, and with-it young girl around town, I always like to keep up to date with the latest fashions. Recently I’ve been going for the 80’s revival look - baggy t-shirts, leg warmers, neon colours, and bright plastic sunglasses. All my friends say I look absolutely ridiculous but, compliments aside, I think it’s time for a change! I’ve decided that punk is going to be my next sartorial inspiration and was wondering if you could give me some pointers to get me started. 1. Get a mohican! Everybody looks good with a mohawk. Just look at the Ed Mascot. He’s got one, and he’s a complete nerd! 2. Do it yourself! Don’t be afraid to customize your own clothes. Safety pins and permanent markers are your friends! 3. Mix it up! Forget the boring rules and regulations of other trends and fashions, this is punk! Red and green can be seen! 4. Start pogoing! Master the art of jumping up and down if you want to fit in. In punk circles this is called dancing! 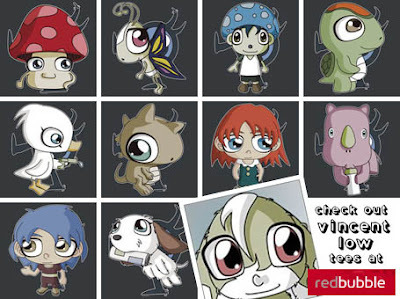 Vincent Low Y H (aka lowvincentyh) is a self taught 2D vector based illustrator that we first met at RedBubble. His cute character designs and unique style made him an immediate hit with all of us here at KawaiiPunk. The illustrations featured here are from Vincent’s t-shirt collection, but his shop also sells artwork on cards, calendars, and prints! And what’s more… this isn’t his only shop! He’s also got a great selection of gifts at Zazzle, so there really is no excuse to not treat yourself! 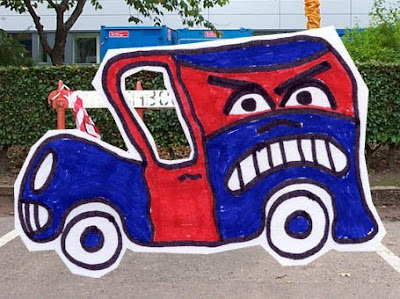 I call it The Grumpy Mobile! And, even if I do say so myself, I consider it to be my finest work to date! Olly “The Oil Slick” Jones. Aged 43. Quite possibly the worst car I have ever seen in my entire life! 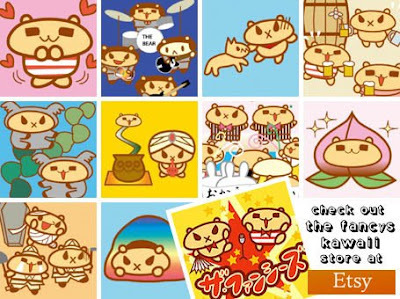 The Fancy’s are an extremely cute bunch of Japanese comedian bears illustrated by the very talented Inomi and Inollica. Their Etsy shop sells postcards, t-shirts, buttons, phone charms, books and even their kawaii pop-tastic music. Which reminds me, if you head over to The Fancy’s MySpace page you can hear them right now! How cool is that? P.S. As always… if you send us a pic of yourself with your KawaiiPunk purchase we’ll post it here for all to see! Come on… what could be embarrassing about that? An unwanted invite to an unappealing event will present itself to you this month. Start thinking of excuses now! A vacant looking man will stare at you in a supermarket queue. Mildly unnerving, but you’ll get over it. A sporting event will cause your favourite TV show to be postponed. I’m getting the name… Wimbledon! Great news! A holiday in the sun will lead to a lifelong romance. Not such great news for your current partner, obviously! An impulsive menu choice will lead to hefty dry cleaning bill! Stick to what you like and you should be fine! A trip to the hairdressers will go disastrously wrong. Now’s a good time to buy a crash helmet! A trip to a casino will have life changing consequences! 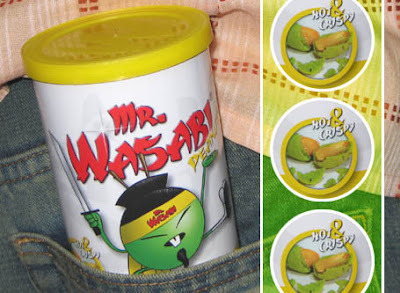 Be prepared to tighten your belt for the foreseeable future! A new pair of shoes will quickly lead to a new pair of blisters! Buying some plasters would be a good idea! Squalor, filth, and disappointment are rife this month. Avoid music festivals and you should survive unscathed! A case of mistaken identity will have hilarious results, though sadly not for you! Best make yourself a name badge! A slip of the tongue will cause you great embarrassment! Probably best if you don’t say anything for the next four weeks! Once again life’s fortunes will pass you by this month. But never mind, I’m sure something will happen in August!